From flying to the Dominican Republic to hiring a private judge, some couples are finding new and creative ways to get divorced. From free Internet downloads to cheap DIY kits at office supply stores, there are a variety of products that profess to help couples divorce without having to pay a lawyer. For example, the $32 Socrates Divorce Kit includes a user manual, a state-by-state rundown of divorce laws and 13 different divorce forms, Meanwhile, many state Legal Aid offices provide their own free divorce packets including the proper forms and guidelines on how to fill them out. 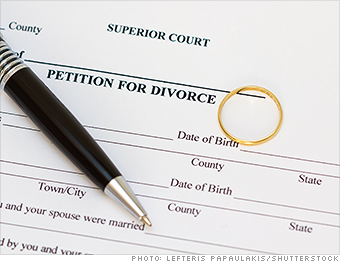 For couples who have no kids and minimal assets to split up, the forms or kits could help them file the proper paperwork to have their divorce finalized by the courts. But most couples will likely need the assistance of attorneys to iron out a fair deal, said Maria Cognetti, president of the American Academy of Matrimonial Lawyers. "That's truly not for anyone other than a young couple, with a short marriage and no assets," she said.